Every panel has a default Transform effect applied. Depending on which panel you're looking at, the Transform effect will let you adjust the position, scale, rotation and anchor point of this composition, this group, this layer or this specific clip. Each Transform effect has several parameters. Adjust where the content's center point is on the X and Y axes. Well, actually, *shoves glasses a bit further onto nose. * Actually, it adjusts where the anchor point of the content is on the X and Y axes. Yes. For all intents and purposes, let's just say Position means you can move them pixely things here and there. Adjust the size of the content, proportionally to its original size. Expanding the parameter will let you scale the width and height individually. Measured in degrees, this will let you rotate the content around its anchor point. Expanding the parameter will let you rotate along each axis individually. If you don't know what an anchor point is, think of it like sticking a pin in the Justin Bieber poster you have on your bedroom wall. Okay. Fine. The Justin Bieber poster that "your sister" has on the wall. Whatever, man. No judging. Depending on where you've stuck the pin, when you now spin the poster, it will spin around that point. 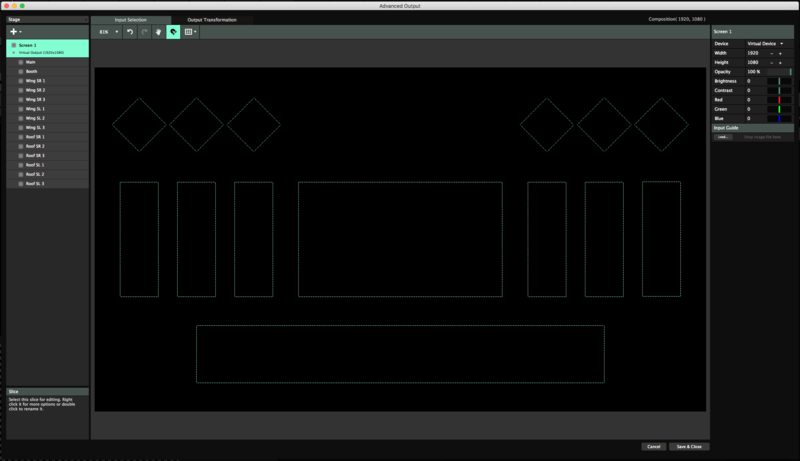 This is exactly what the anchor point does in Resolume. The anchor parameter can also be expanded. You can apply more than one Transform! Transform is available as an effect in the Effects list, and you can apply it anywhere in the effect chain. This way, you can do crazy stuff like first scale down and move a layer to the left half of the screen, then apply a mirror effect, and finally position the result of this in the bottom right of the composition. Options galore! Any transform you apply after the first one, will have its own Opacity and Blend Mode, just like an effect. 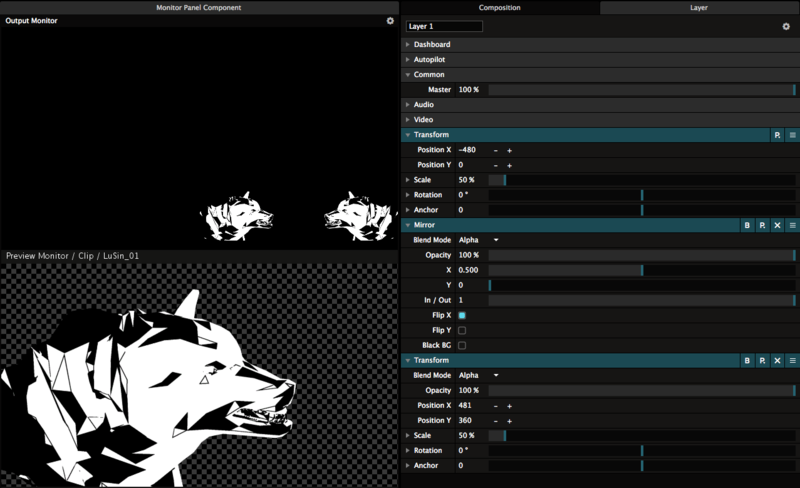 This way, you can control how the Transform blends with the input texture. The very first Transform in each panel can not be deleted. 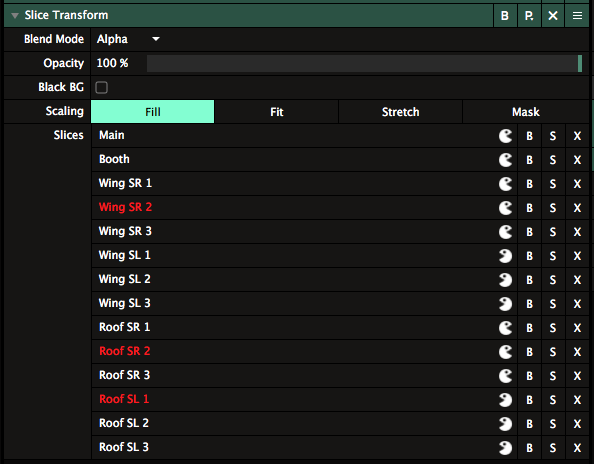 Each Transform setting can be saved as a preset. This gives you quick access to PIPs and scalings that you often use. On Arena, you get access to a very special type of Transform. It's available as an effect under the moniker Slice Transform, but the best way to access it, is to open the Slice panel via View > Show Slices. 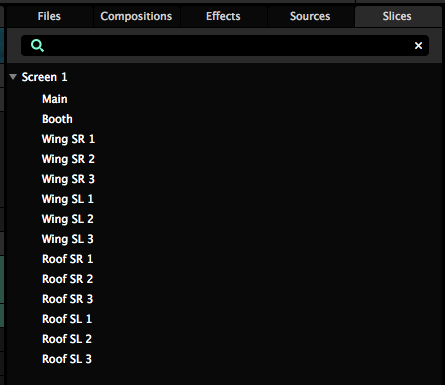 The Slices panel will show you all the screens and slices you currently have available in the Advanced Output. Now, by dragging the Screen onto a clip, a layer, a group or the whole composition, you can instantly place content in every slice in that screen. The Slice Transform effect works with regular slices, polygon slices and fixtures, takes into account the orientation of the slice, and respects any input masks applied on the slice. Changing the slice in the Advanced Output will update the scaling of the content automatically. By default, the content will be scaled to Fill within the slice. This will fill the slice with the content, and crop the sides or top and bottom if the aspect ratios don't match. You can switch to Fit, in which case it will scale the content to be completely visible in the slice, possibly adding empty pixels on the sides or top and bottom. By using Stretch, the content will be warped to match the shape of the slice exactly. In Mask mode, you leave the content as it is, and essentially use the Slice Transform as a mask to show and hide specific parts of it. You can use the B toggles to temporarily hide content for that specific slice. The S button will Solo that slice and hide the others. If you don't need content to show in a particular slice, you can hit X to get rid of it. If you realise you needed it after all, you can simply drag the slice back in from the Slices tab. You can use the Pacman icon to toggle each slice through 4 orientations: Regular, Mirrored Horizontally, Mirrored Vertically, Mirrored Horizontally and Vertically. Of course, instead of dragging the whole screen to create the Slice Transform effect, you can also drag a selection of slices instead. This is a great way to assign content to specific areas of your stage. For instance, you can show the DJ name, set to Fit on just the main screen and DJ booth, while showing the promotor logo behind it, set to Fill on the main screen and on the tiles on the roof. Background content can be shown everywhere, masked on every slice. Because Slice Transform is an effect, you can use it to apply these looks on specific clips. This way you can have multiple instances of a clip, each with a specific look. Also, you can create presets to quickly recall specific looks and switch between them. Because Slice Transform works with the slices in your Advanced Output, it might be that a particular slice can't be found. Maybe you accidentally deleted it, maybe you've loaded in another preset. Whatever the reason, Resolume doesn't panic. It just lets you know something is missing by highlighting the slice in red. Any remaining slices will continue to display just fine. This is done to give you an indication that something is up. You can then go in to Advanced Output to do what needs to be done to correct it, or just delete the slice from the effect if you don't need it anymore. When you accidentally deleted a slice in the Advanced Output, undoing it will bring it right back, both in the Advanced Output and in the Slice Transform effect.